I wanted to follow up my last post on 3D Parallax effects in HTML or Adobe DPS, I’ve decided to release some of the other experiments that I’ve been exploring with device motion in DPS publications. Check out the video below to see two new samples, and a corrected version of the strawberries example from my last post (the plants were going the wrong way in the last post). 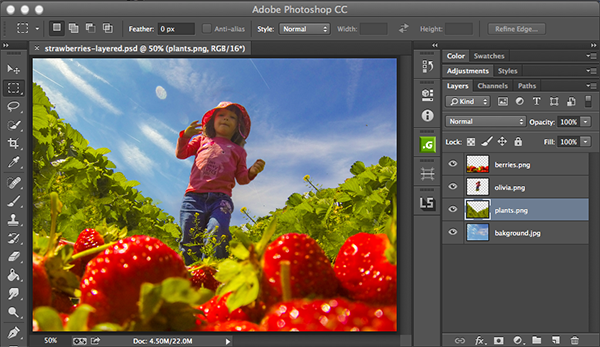 The Adobe/inline content example is implemented in the same manner as the strawberries example. The large city image It is a two-layer composition created with Adobe Edge Animate. The foreground building and flag move independently from the background image. 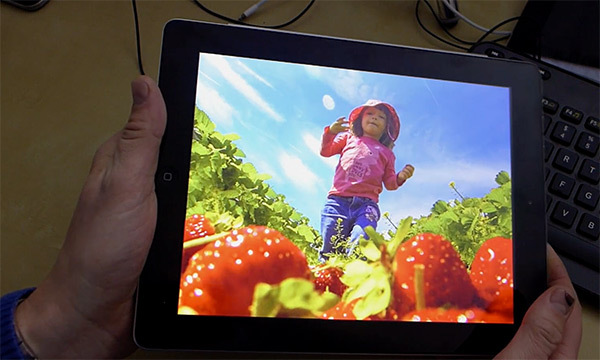 I used Photoshop to separate the content into layers and made them animate based on device orientation in the exact same fashion as the strawberries sample. 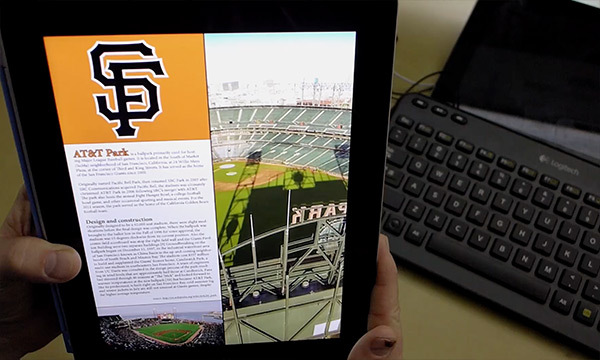 All of the text and image content surrounding the cityscape panorama is laid out with InDesign. The image used in this example is a vertical panorama captured from a remote control helicopter. This image contains various perspectives that have been composited in Photoshop. The motion of the device is aligned to match the perspectives in the image/viewport; When the device is facing down, the image is looking down and when the device is vertical, the image faces forward. You can check out the vertical panorama image below. If you’re interested in creating a vertical panorama, be sure to check out this tutorial from Russell Brown. … and the CSS styles used to apply the background image. A few weeks ago, a fellow Adobe colleague showed me a DPS publication that had an amazing design. All of the content looked great by itself, but what really made parts of it “pop” was that in certain areas there was a 3D parallax effect, which made it feel like you were looking into an image that had depth. You could rotate the device and see what’s hiding behind a person, or around the corner of a building. I thought this was an incredible example of added interactivity and immersive experiences, and it’s not really that difficult to implement. In fact, I put together this tutorial to show exactly how you can create these types of effects in your own compositions. 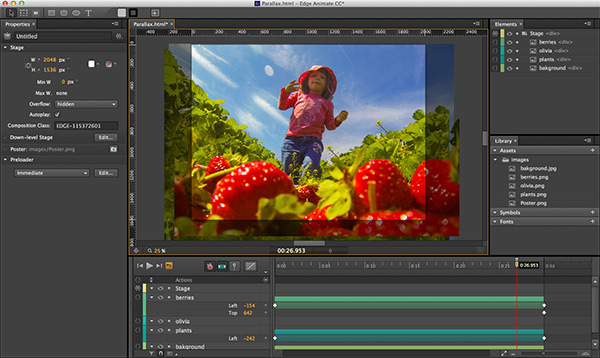 To create this kind of an effect, the first thing you need to do is break apart an image into layers – note: you may need to synthesize edges so that there is an overlap in all transparent areas. Then you need to add interactivity in HTML. Align those images so that their default state looks just like the still image, then move the images based upon the device orientation. I move the foreground one way, keep the middle content more or less stationary, and move the background content the opposite direction (all based upon which way you are rotating the mobile device). Since this is all HTML, you can take this content and use it on the web, or import it into Adobe InDesign to export a DPS digital publication. You can either create your own layers, or break apart an existing image into layers so that each individual layer can be placed over top each other to form a seamless composition. 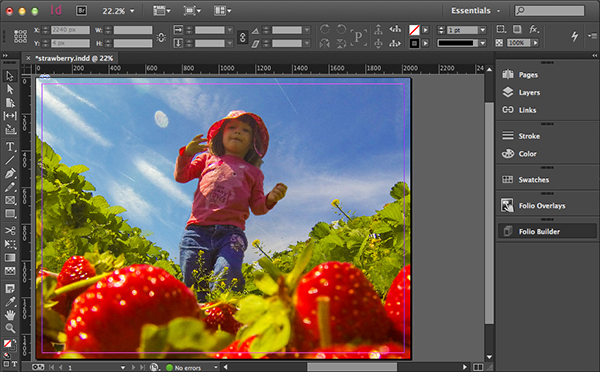 In this case, I separated the strawberries, the rows of plants, my daughter, and the sky out to separate layers. Next, pull all of those images into an Edge Animate composition so you can create the parallax behavior on the timeline. I actually used the exact same technique that fellow Adobe evangelist Paul Trani uses in his parallax scrolling example. Update 1/7/2014: I added logic to support both landscape and portrait orientation. At this point, you could publish the composition and use it on the web – there’s nothing stopping you at all. In fact, you can check it out here, just load it on an iPad and rotate the device to see the effect. However, please keep in mind that 1) I haven’t added a preloader, 2) the assets are non-optimized and are all retina size , 3) I don’t have it auto scaling for the viewport size, so it will only look right on a retina iPad, and 4) I have only tested this on an iPad – no other devices. Note: You could also do this without using Edge Animate, but you’d have to hand code the HTML/JS for it. You can download the source for the Edge Animate project here. 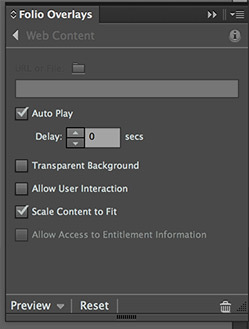 To include this in a DPS publication, all that you need to do is export an Animate Deployment Package (.oam file) from Adobe Edge Animate. You can then just drag and drop this into InDesign for inclusion in a DPS publication. Be sure to check out the DPS Getting Started Guide to learn more about DPS, and check out the docs on Web Content Overlays to learn about HTML usage inside of DPS publications. If you aren’t already a member of Creative Cloud, join today to take advantage of all of our creative tools! Update: After publishing this I realized that the movement of the plants should actually be reversed. If you view this link, you’ll see the updated motion (which looks more realistic), but I can’t update the video that’s already been published. This includes CSS Regions, Clip Paths, and Canvas Blend Modes… read more on the Adobe Web Platform Team blog. Adobe Edge Reflow and Adobe Edge Code now support CSS Regions. CSS regions is a revolutionary CSS specification draft that allows a deeper separation of concerns in the way designers and developers structure their content and layout. They can now manage the way content should flow across different regions of the page design (hence the name CSS Regions) separately from the content itself . Then content can now be made to flow in different chains of regions, typically laid out differently for a mobile, tablet or desktop/laptop use. All in all, this is a lot of “awesome”. 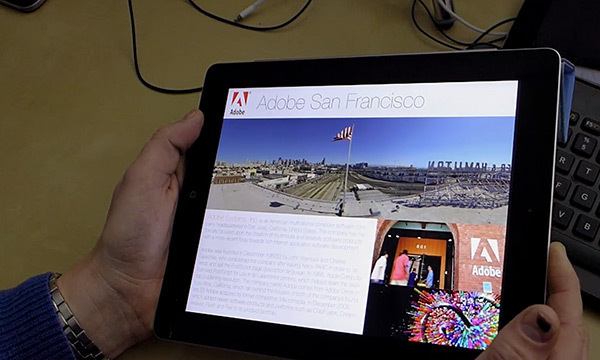 Adobe Edge Inspect CC is an awesome tool for synchronized browsing experiences across both desktop and mobile devices. It is incredibly powerful, and streamlines the developer & testing workflows by reducing iterations when testing HTML/JS experiences on multiple devices. Adobe Edge Code CC is an awesome code editor for creating HTML/JS experiences. It has a live connection to the browser, so you can see your edits in the browser in real time as you are editing your code… all without having to leave the code editor. Amongst the big announcements last week, you may not have noticed that the Adobe Edge Web Fonts got a huge upgrade too! 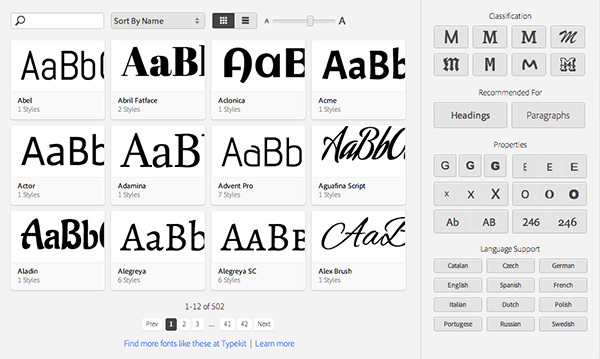 It’s now easier than ever to browse web fonts and include them into your own HTML experiences. All for free, with no Creative Cloud membership required! Also shown in the video is Adobe Edge Code for live editing/previewing HTML in the browser.